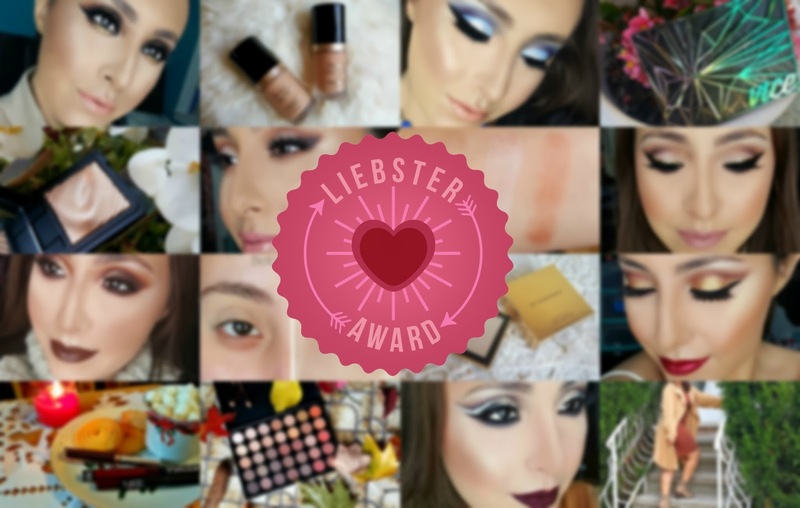 Beauty Addict on a Mission: I Was Nominated For The Liebster Award! About a week and a half ago I was nominated for the Liebster Award by the lovely Vicki from The Beauty Prep (thank you so much!) I thought that the first day of the year was the best time as any to do my blog post on it. Now you might be asking, "what the heck is the Liebster Award?" Well, to put it simply, it is an award for newbie bloggers by other bloggers. So you see...what better way to start off 2016 than by spreading the love and support to fellow bloggers. I've actually seen this award floating around social media and it is given to those up-and-coming bloggers that show a lot of promise in their respective niches. That being said, I'm very humbled to be acknowledged in such a way as I've really been putting serious effort into my blog the past couple of months. 1♥ Thank the person who nominated you and post a link to their blog within your post. 2♥ Display the award on your blog in some way, whether it's on the post itself or as a widget in your sidebar. 3♥ Answer the 11 questions that the blogger who nominated you wants you to answer. 4♥ Provide 11 facts about yourself. 5♥ Nominate 5-11 blogs that you feel deserve the award. The bloggers you nominate must have less than 1000 followers. 6♥ Create a new list of 11 questions for the nominees to answer. 7♥ List these rules in your post. 8♥ Inform the bloggers you have nominated and leave them a link to your blog post in case they don't have any idea what the Liebster Award is. Facts About Moi 1♥ I never thought I would be into makeup the way that I am because I was an extreme tomboy growing up. I mean extreme tomboy--I dressed like a boy, played sports, and rough-housed a whole lot. 2♥ In college I studied nursing and had a 4.0 GPA (go figure haha). 3♥ I started this blog because I wanted to discuss beauty from the perspective of someone who deals with and suffers from acne, but really enjoys makeup. When I would research products that I wanted to purchase, I wouldn't find enough information about ingredients or how it interacts with sensitive skin, so I felt that this was an important gap to fill. 4♥ You probably can't tell from social media, but I'm very shy. Some people have misconstrued that as being stuck up, but I'm just very introverted unless I'm around people with similar humors and personalities. 5♥ I'm a foodie. I have foods that are my tried and true, but I also love to try new things. Food is the way to my heart. Food is life. 6♥ I was born in New York City on a December day, but the cold is completely intolerable for me. I think someone lied to me. I was probably born during a Summer month in a tropical land far far away. 7♥ Prior to working with special needs children, I had absolutely no experience around young kids as there are none in my family. That being said, if I taught them 10 things, they taught me 20 more. Working with kids not only teaches you patience, but it also reminds you to be light-hearted and compassionate no matter what problems are going on in your life. 8♥ When I get older, I'm probably going to have a whole farm of animals from dogs to pigs to koalas. Serious animal enthusiast over here. Don't they have a way of making you so happy? 9♥ I'm 23 years old...and I can still fit into size three sneakers...for school age kids. In my defense, I haven't grow at all since the sixth grade. 10♥ I don't have any siblings, so if I could change anything about my life, it would probably be that. 11♥ I dream of traveling the entire world. I have only been to a handful of places, mostly in the USA, and I know there is just so much more to see and learn about the world than I could ever learn here at home. Vicki's Q's & My A's 1♥ What made you start blogging? How ironic, I actually gave away this answer as one of the facts about me. Well, I guess there's more to it. I used to do makeup professionally and always got asked to teach people how to do makeup and my opinions about different products. Also, as I mentioned before, I wanted there to be more information out there for the consumer that suffers with acne. Since I myself suffer with it and have had a lot of trial-and-error with beauty products myself, I felt I was the perfect candidate for the job. 2♥ Name your all time favorite holy grail beauty product. Questions like this will probably be the death of me--this is like asking to choose between children! If we're talking about makeup, I would have to choose the LA Girl Pro Conceal Concealer. This product can serve so many different purposes from concealer to foundation to eyeshadow primer. The line has an enormous range to choose from whether you want it to blend into your skin tone, to highight, or to correct--it's got you covered. Plus, it's only $2! If we're talking about skincare, I'd have to say I'm addicted to my Vanity Planet Ultimate Skin Spa System. It's one of those spinning facial brushes that has really changed the dynamic of my skin. I believe it's one of the reasons my acne has diminished so much. 3♥ What's a goal you'd like to achieve in 2016? On top of my blog, I've been working very hard on my social media. So by the end of 2016, I'm hoping to have over 10,000 followers. It's a really big goal, but I think I can do it. 4♥ What would be your superpower? That's easy. I would teleport. It would make my dream of traveling that much easier. I love all animals, but I'm a dog person for sure. There's something about how funny, energetic, and loyal a dog's spirit is that makes me enjoy them so much more. 6♥ Are you left handed or right handed? Or both? I'm ambidextrous actually. When I was younger, I jammed the fingers on my right hand, which made it necessary for me to learn to do things with my left and it stuck with me ever since. 7♥ Who has been your biggest inspiration and why? It's hard to pinpoint just one person, but I think I've been inspired most by an act instead--selflessness. I feel like I'm surrounded by people who don't get to pursue their dreams for one reason or another and I feel that I owe it to myself and them to pursue what I'm most gifted at and not waste any opportunity that comes my way. 8♥ What's a talent you wish you'd have? I wish that I could sing because music is a huge part of my life. It is one of the things I depend on most as a stress reliever and I can't go a day without listening to it, so that would be pretty cool. 9♥ What's your favorite ever TV series? While I love the action genre for both film and TV, I think my favorite TV show yet would have to be How To Get Away With Murder because of how insane and intricate the plot is. 10♥ What's your dream holiday location? I've wanted to visit Paris since I was in college, so going there during the Spring or Summer would probably be magical. 11♥ And finally, what's a blogging tip for new bloggers starting out? A lot of people will suggest investing in a good camera, but honestly, cellphones nowadays come equipped with amazing back-facing cameras and natural daylight is a free source at your disposal. My biggest tip would be to only post things you're absolutely proud of. When you're working on a strict schedule like I am, it's easy to feel pressured, but I urge you to only put out your best. It's better to be consistently proud of yourself and your posts than to try keeping up with everyone else's quantity of content. Now on to the good stuff -- the bloggers that I'm nominating! All of these gals are truly incredible at what they do. As a blogger, there's a certain balance between good, descriptive writing and amazing photo captures that you need to draw people in. With that being said, I don't think any of them have anywhere near the following that they should. As a disclaimer, I nominated bloggers based off of their follower counts displayed on either their blogs or on Bloglovin'. 1♥ Other than blogging, what is your favorite thing to do? 2♥ Tell us one thing that no one else knows about you. 3♥ Where do you find your daily inspiration? 4♥ What is your favorite AND least favorite aspect about blogging? 5♥ If you could improve one thing about yourself, what would it be? 6♥ Name your biggest guilty pleasure. 7♥ What is one beauty/fashion item that you can't live without? 8♥ What was your favorite subject in school? And why? 9♥ Are you a flats or heels kind of gal? 10♥ What is your greatest achievement thus far? 11♥ What is your biggest goal for the new year?